AUSTRALIA exported 28,456 tonnes of chickpeas in August, up 13 per cent from 25,231 tonnes in July, according to the latest export data from the Australian Bureau of Statistics. 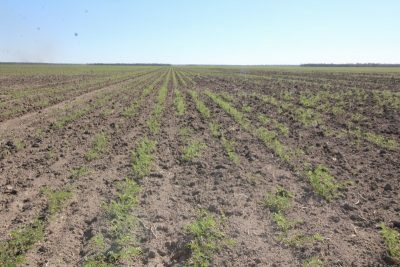 A chickpea crop at Mungindi on the Queensland-NSW border shows the effects of a challenging season. Increased sales to Nepal and the United Arab Emirates helping to boost the August tonnage, while shipments to Pakistan, Australia’s biggest chickpea market in the continued absence of Indian buying, fell to their recent low of 14,850t, down 25pc from 19,910t shipped in July. Australian Choice Exports managing director, James Hunt, said demand from Pakistan is expected to kick in early next year in the lead-up to Ramadan in May and boost export figures for first-quarter shipments. “We’ve got competitors in Russia and Tanzania which are selling cheaper than we can, so Pakistan is buying from there at the moment, but they have relatively small crops and they’ll run out by December,” Mr Hunt said. Bids for new-crop chickpeas are sitting at around $800/t delivered to packers on the Darling Downs, but offers from growers are closer to $830/t. “Growers think they should get more than they’re being offered at the moment on new-crop, and they are very happy to hang on to what they’ve got. Mr Hunt said Queensland’s chickpea harvest to date has been “a real mixed bag”. Some crops have been cut for hay because of their very low yield prospects, while others have come in at more than 1t per hectare. Many Central Queensland crops north and south of Emerald were hard hit by late frosts, leaving pockets of the Western Downs and Maranoa to have what are expected to be Queensland’s best yields of 1-1.5t/ha. Small areas north and east of Goondiwindi have reasonable yield prospects, but very few chickpea crops have been planted in central and eastern parts of the Darling Downs due to limited reserves of subsoil moisture. Frost-affected yields have seen some Queensland crops return as little as 0.3t/ha, but anything below that is likely to be cut for hay to feed stock in drought-affected areas. Growers on the Maranoa and Western Downs are now flat out harvesting their crops ahead of forecast storms, while the chickpea harvest in New South Wales will be unusually small, again due to limited subsoil moisture. Pulse Australia’s most recent estimate for Australian chickpea production was released early August, and pegged output at 300,000t, around one-third the size of the crop harvested in 2017. Table 1: Australia Bureau of Statistics chickpea export data for June, July and August 2018.